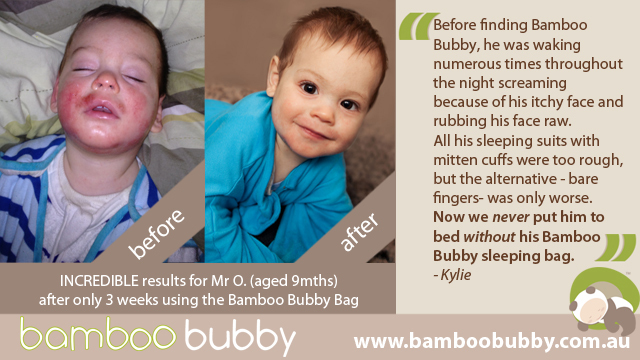 Bamboo Bubby Bag™ was designed for toddlers and babies with eczema. This baby to toddler sleep sack with sleeves ensures a good night's sleep while allowing your child's skin time to heal. The closed mittens keep fingers from scratching and guarantees hands and body are protected. The bamboo/cotton fabric is not only soft and cooling, but it's also gentle on sensitive skin. These toddler to baby sleep sacks with sleeves are also antibacterial and moisture wicking, so it prevents itchiness due to overheating. One size fits ages 6 months to 2+ years via adjustable sleeves. Contains naturally antibacterial, cooling, and wicking bamboo fibers - great for eczema. Made with the extra softness of bamboo and the additional strength of organic cotton. Double ended zipper makes night time diaper changes quick and easy. Fits securely into car seat and stroller harnesses with a seat belt slot. Helps to stop thumb sucking. Fabric is Oeko-Tex Standard 100 Certified & OCIA Certified. For best results apply Organic Manuka Skin Soothing Cream or another of our natural eczema creams underneath the sleep sack for all night moisturizing and skin soothing. The bag is long enough to easily fit the height of an average 2-3 year old. There is a snap in the underarm of the sleeve which allows you to adjust the length of the arms - shorter for a young baby and longer lengths as your child grows. Medium to heavy weight material. 70% bamboo vicose (Tanboocel) & 30% organic cotton interlock fabric. The bamboo is derived from both sustainably harvested wild crop and organically certified farmed bamboo. Wash in cold to warm water (up to 140F/60C) on a gentle to normal cycle with a gentle detergent, free of bleach. Line dry upside down with arms downwards, preventing any stretching of the fabric around the neckline and allowing the sleeves to dry thoroughly. If necessary, the Bamboo Bubby Bag can also be machine dried on a cool setting.